One LED connected to the 1802's “Q” output bit. Several articles appeared in Popular Electronics in the months that followed. In September of 1976 Weisbecker showed readers how to add a hexadecimal keypad to the computer, how to have fun with it's I/O ports and add battery backup to the RAM. March of 1977 saw Weisbecker's third installment in the series, in which he introduced the concept of an operating system, a “a program that makes it easier to program and use your computer.” His ETOPS (Elf Toggle OPerating System) program presented in the article took up 32 bytes of RAM, and EHOPS (Elf Hex OPerating System) consumed a whopping 74 bytes. With only 256 bytes of memory to start with, things were becoming a little tight, so Weisbecker went on to describe the construction of a 1,024 byte memory expansion. 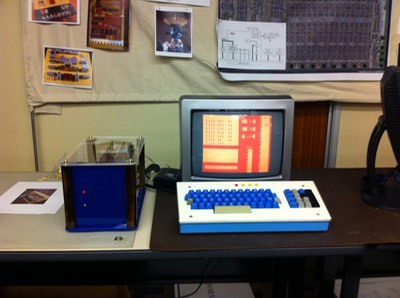 In July of 1977 Weisbecker added graphics to the ELF using RCA's 1861 “PIXIE” graphics chip. This odd little beast had a resolution of 64 bits wide by 128 bits high, and interfaced to the 1802 by its interrupt line, one of the 1802's four “external flag” input lines, and the 1802’s version of DMA. Programming for the 1861 was tricky, requiring careful timing and cycle counting in the interrupt service routine. By manipulating the DMA pointer, software could create the appearance of lower vertical resolutions. 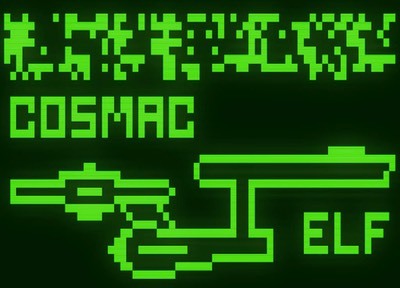 Weisbecker published an example of a 64x32 display featuring a starship image that would forever be associated with the ELF computers. The article also made mention of an alternate source of an ELF computer for hobbyists who either came late to the game or didn’t want to hunt down the parts on their own. A company named Netronics Research and Development in New Milford, Connecticut was producing a computer christened the ELF II. The ELF II featured a hexidecimal keypad, 1861 graphics and 256 bytes of RAM, and also added an 86-pin expansion bus. A “Giant” board provided cassette I/O, serial and parallel I/O and a small monitor ROM, and 4K RAM expansion boards were also available at about $90 a pop. Netronics also sold ASCII keyboards and a version of Tom Pittman's Tiny Basic. Some may remember Tom Pittman from the Steven Levy book Hackers. Pittman, a freelance engineer, was a member of the Homebrew Computer Club who Levy characterized as a “software wizard.” Tiny Basic and its manual weren't the only Netronics offerings written by Pittman: they also sold a $5 booklet titled A Short Course in Programming that taught 1802 machine language, step-by-step, from blinking an LED to the obscure programming required for the 1861. As short as his course was, Pittman introduced the reader to the full host of 1802 microprocessor features without dependence on a technical vocabulary. Pittman also contributed to periodic newsletters for Netronics customers. RCA joined the 1802 computer market with the VP-111 (known popularly as the “VIP”). The VIP contained a cassette interface, audio circuitry, 1K of RAM (expandable to 32K), and 512 bytes of ROM. Like the Netronics ELF II, the VIP had a proprietary expansion bus with various cards available. 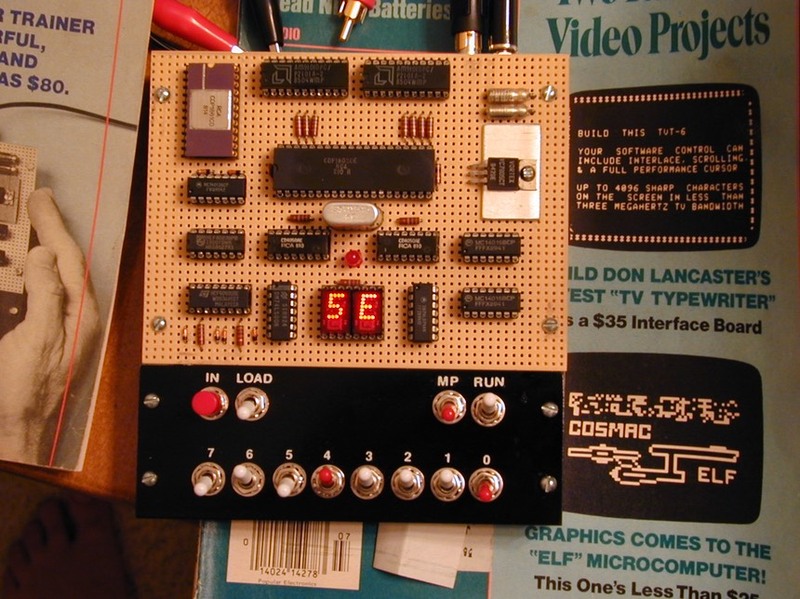 The VIP came with a 31 instruction interpreter, CHIP-8, that gave users a higher-level way to write simple video games. Some of the games shipped by RCA were written by Joyce Weisbecker, Joseph Weisbecker's daughter. RCA sold Tiny Basic as a 4K ROM on an expansion board. RCA also produced some terminals based on the 1802, the VP3301 and VP3303. Both TVTs featured a membrane ASCII keyboard and could display 24 lines of 40 characters or 12 lines of 20 characters in eight colors. The terminals connected to a modem or host computer via RS-232C or 20mA current loop. The VP3303 differed from the VP3301 in that it provided a built-in RF modulator for connection to a television set. It is also worth mentioning that RCA produced a video game based on the 1802, the Studio 2 sold by Radio Shack. Like most of the 1802-based microcomputers, the Studio 2 used the 1861 for video output. 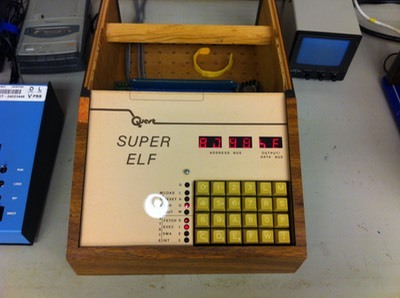 Quest Electronics entered the fray with their SuperELF, which took the 1802 a bit further than the Netronics ELF II. The SuperELF had buttons for Reset, Load, Go, Wait, Input, enabling a 32-byte Monitor ROM, memory Protect and Single step. SuperELF users could add 2 or 4 additional 7-segment LEDs to display the state of the address bus, which was very handy when keying in long programs. Still more LEDs displayed the CPU state (fetch, execute, DMA or interrupt) and mode (reset, load, run or wait). The SuperELF even allowed expansion via the popular S-100 bus. Quest produced a newletter called Questdata for its customers. Still more systems were built based on the 1802, though these are somewhat more obscure. The ETI-660 sprang from the pages of Electronics Today International, a publication which sold their name to another company in 1999. The ETI-660 was intended to be programmed in CHIP-8. The DREAM 6800 deserves special mention here despite being based on Motorola’s 6800 microprocessor rather than the 1802. It is often erroneously credited as being an 1802 machine because it also implemented the CHIP-8 interpreter. CHIP-8 was popular on the 1802, but was not exclusive to it. Possibly the last commercial microcomputer produced with the 1802 was a 1983 machine named the Comx 35. The Comx 35 took the form of an ASCII keyboard with an integrated joystick and BASIC in ROM. Unfortunately, by 1983 the 1802 was hardly cutting-edge technology, and the slow speed of the machine quickly sealed its fate. With the commercial offerings as well as the Popular Electronics introduction to 1802-based computing, the formation of users groups was inevitable. One newsletter, VIPER, supported RCA VIP users and was published from June 1978 to June 1980 by Terry Laudereau of Aresco. Each issue of VIPER was about 32 pages long and contained software and programming information, such as ready-to-run games in CHIP-8. RCA sponsored VIPER indirectly through advertising, and by June of 1979 there were 542 subscribers. Terry began to go blind during VIPER's second year of publication, and the newsletter ceased after completion of the second volume. The Association of Computer Experimenters (ACE), later known as the Association of Computer-Chip Experimenters, formed in the late seventies in Ontario. The group's bimonthly newsletter, Ipso Facto, ran up to several dozen pages in length and soon attracted an international following. Issues were packed with hardware hacks and software for various 1802-based computers. Software was typically published as a hexadecimal dump, often hand-typed, since relatively few members were working with the luxury of an assembler or printer. Occasionally there would be an article with software in Tiny Basic or CHIP-8, but the lion’s share of software through about 1980 was hand-written in 1802 machine language. ACE then started selling cassettes loaded with an implementation of the Forth language as published by the Forth Interest Group. Like Tiny Basic, figForth was small enough to be practical on computers with limited resources. It also featured an outer interpreter, which allowed users to work interactively with their computers. Unlike Tiny Basic, though, figForth compiled (or tokenized) subroutines into a form of threaded code. This code was then processed by a very lean inner interpreter, yielding an execution speed far greater than that provided by Tiny Basic. Judging by the numerous Forth articles that began to appear in the pages of Ipso Facto, figForth was a hit with 1802 computer enthusiasts. The diversity of systems was an occasional source of frustration for members. Articles dealing with CHIP-8 were of little interest to members who didn't own RCA’s interpreter, for example. While this complicated the club’s publication of software, it made the creation of expansion hardware seem impossible: the VIP and ELF II expansion buses were incompatible, and people who'd built an ELF from the Popular Electronics article didn't have an expansion bus at all. Eventually, ACE developed their own bus for 1802-based computers, and designed boards to adapt different systems to the ACE bus. The hardware to do this was rather simple since, in general, the different buses all had the same signals available. This facilitated some rather clever design. The adapter for the ELF II, for instance, required that an 86-pin connector be soldered on the bottom of the ELF II's circuit board. The ACE bus adapter plugged into the bottom of the ELF II, raising it up at an angle and making it a sort of front panel to an ACE bus card cage. Armed with a common bus, ACE began to design, publish and sell their own circuit boards. Boards were bare and came with schematics, a parts list and a parts placement diagram. ACE created a 64K dynamic RAM card, a floppy disk controller, a video card based on the Motorola 6847, and eventually their own CPU card. The CPU card’s flexible design allowed it to function as either a standalone single-board computer or as a controller in an ACE bus system. 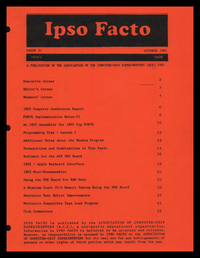 By around 1983, issues of Ipso Facto became noticeably leaner as member contributions dwindled. New technology lured members away, and ads for 1802-based microcomputers disappeared from the back pages of electronics magazines. The day of the 1802-based microcomputer had passed. Nonetheless, 1802s all over the world remained hard at work. Swiss payphone manufacturer Sodeco-Saia used the 1802 for phones in France, Austria and many African and third world countries, where its low power allowed the unit to work entirely from the power of the phone line. Indeed, the 1802 found a home in many low-power embedded systems — and not just on earth. Inside the Galileo space probe and other satellites, pulse tiny 1802 wafers, forever securing this microprocessor a place in history.